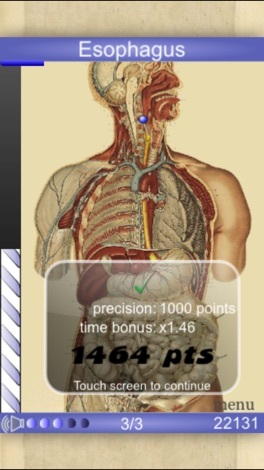 Impress your doctor with your cunning intellect on your next visit after playing Speed Anatomy! -Earn points for precision and speed. -Compare high scores with your facebook friends using OpenFeint. -A magnifying glass appears when holding your finger on an image allowing you to achieve more precision and higher scores. 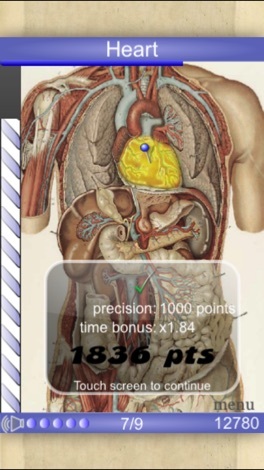 This games is fun for everyone and it makes life easy for those tackling anatomy for high school, university or medical school. Practice mode allows you to learn specific regions without doing all the previous levels. Review mode lets you replay all the mistakes you made in the last game. Try Speed Anatomy the full version which contains close to 300 labeled parts from all the main regions of the body! Contains English, French and German version. Also try Speed Bones MD, Speed Muscles MD and Speed Angiology MD for more in depth levels of bones, muscles and the circulatory system! The free Speed Bones Lite is also available. I'm open to suggestions so don't hesitate to send me an e-mail if you find something is missing. La Perla's ultimate Valentine's Day Gift Guide. You dream of wearing a sword of lightning, but it is obviously impossible? Thanks to Star Saber, you can retouch your images/photos with the sword of your choice. Turn your friends into modern knights! Share your achievement by mail, facebook or twitter.